Let’s go back in time, to the year 2013 AD. Think of what you have achieved and learned since that era. Have you found a new career path? Have you started playing some new games? Have you got Rebecca Black’s Friday out of your head yet? Well, up to that year I had little experience with video games. The main things I knew were that big pools of acid hurt, and that I couldn’t aim at all. Most important for this article, I hated shotguns. They made no sense to me, with their miniscule ammo capacities, horrendous reload times and damage falloff. Yes, I was that guy who tried to use a shotgun at long range. Consequently I always preferred to use explosive weapons or assault rifles. But then I found a new game which I really liked. I bet 99% of you have at least heard of this game. It is Half-Life 2, an incredible story-driven adventure that sits far apart from other games with an inexplicable excess of explosive barrels. In HL2 there’s a chapter in which the player must fight through Ravenholm, a town infested with zombies. This is where I was first introduced to the shotgun that changed my life. From the window across the street it came, a gift from the gods (actually Father Grigory). I’d later learn to call this thing the SPAS-12, or the Combat Shotgun as it’s called in Left 4 Dead 2. Grigory suggested that I use this new gun to shoot incoming zombies in the head. Since I’d run out of ammo for my other guns and I forgot about my crowbar, I followed his advice. Holy cow, it delivered. Creatures that could have absorbed a whole mag of SMG bullets were silenced in one blast. Those zombies were in pieces and I was on my way out of the town. Suddenly the shotgun made sense to me! Its damage falloff is due to the nature of the shells it fires. Shotguns shoot pellets that disintegrate and spread out in a cone shape. The further a target is, the lower the proportion of pellet that hits them. But if the target is very close, the entire pellet can go into them and cause a heck of a lot of damage. I no longer cared about the slow reloads. When you can kill something in one hit, reloading isn’t so much of an issue. My message is this: do not underestimate the shotgun. I know many TF2 players who still don’t like the shotgun, even after I explain to them how it works. 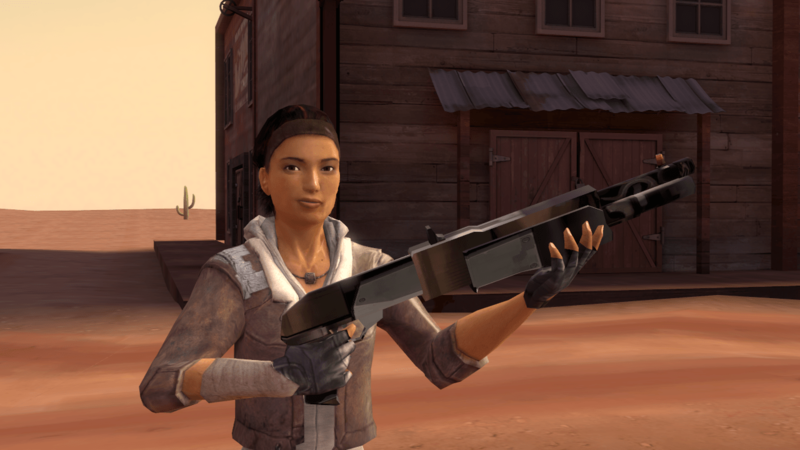 Remember that four classes have a shotgun as standard (five including Scout’s selection of sawn-offs). People tend to ditch these to swap out for alternative weapons. A Flare Gun for Pyro, Rescue Ranger for Engineer, delicious snack for Heavy. So what? The fact that four classes have the same shotgun tells us something. It’s Valve’s way of saying, “This is a useful weapon. Have fun with it.” So I’ve done a lot of testing of it lately. It’s hopeless at long distance, but that’s not its domain. Leave long-range targets for the Minigun or the Pistol. 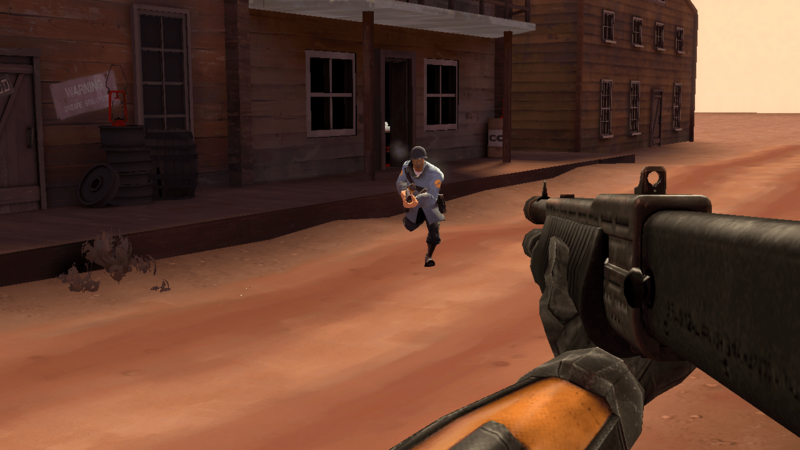 Your shotgun is there to help you when a Spy is creeping up or a Demoknight is ready to charge at you. It’s not something to scoff at. Since buying Half-Life 2, I’ve developed a great respect for shotguns in all games I play. Now I’m not the guy who lobs grenades everywhere or empties his SMG into one Antlion. I’m the guy who dashes around corners, runs up to enemies and makes their heads explode. 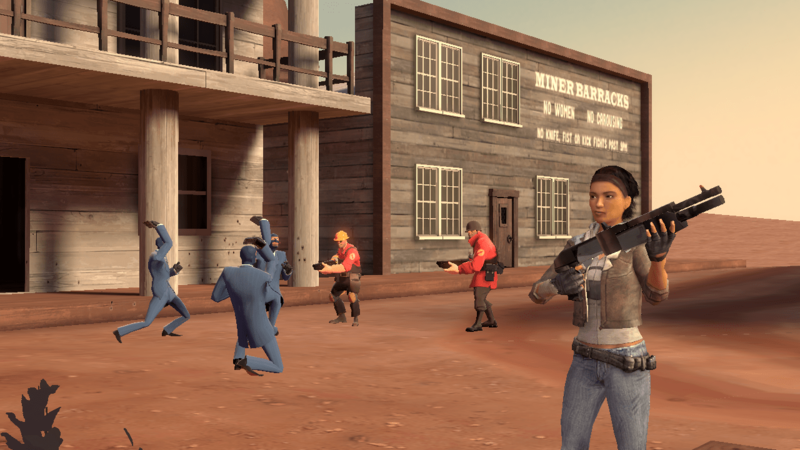 Practice the way of the shotgun in Team Fortress 2 and you’ll be a better fighter for it. This weapon is your friend. Unfortunately, not even Alyx can hold off the Spycrab horde. ← What’s your most sentimental item?